Geeetech I3 A Pro: E3D V6 + Titan + Cooling by core2 is licensed under the Creative Commons - Attribution license. Printing the fan (in one piece) with materials with less good bridging behavior like PETG is quite hard. I wanted the reduce the influence of a rough surface on the airflow. By deviding it into three parts its much easier to print cause of the lesser printheight and the new alignment. I also made all parts a bit thicker, so the fan isn't that fragile as before and the parts are easier to glue. First of all I have to say thx to "bliatun" for his great design and sharing his idea. 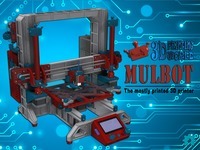 His extruder mount is compact and easy to assemble. So I decided to adjust it to my "Geeetech I3 A Pro". Use a probe (BL-Touch) without printing an extra mount. Created a simple beltholder, because the "I3 PRO A" already has a belttenioner that works quite well. So there is no need for two! Added new screwholes to the extuder-mount. Two for the new belttenioner and one for the endstop (x-axis). 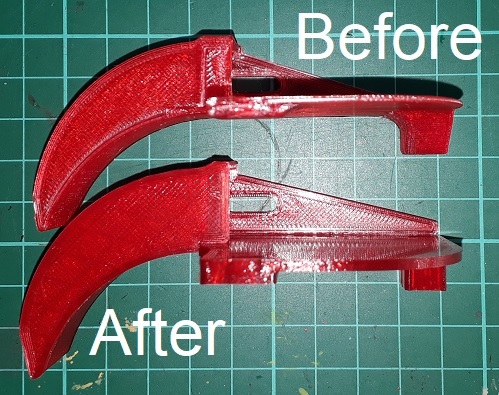 This prevents the cooling fan colliding with the printer frame. Slighty adjusted the belttenioner notch to the dimensions of the "I3 PRO A". 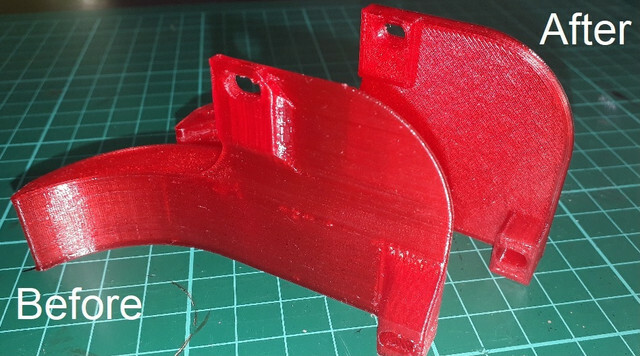 Made two version of the extruder-mount with 1mm and 1.5mm thickness of the face where you install the Titan resp. the new NEMA17 stepper motor. Please print all parts as aligned in the stl files. Especially the belttenioner, otherwise you loose accuracy at the notch for the belt. Found out, that if you are using a Titan extruder clone, there are some differences in the dimensions. So you have to test if version 1 oder 2 works for you. If you are using the "17HS10-0704S" stepper motor, you have to switch the connection wires (red + green) as shown in the picture! Also lower your voltage at your stepper driver to 0.3 volts. Thats enough for the pancake motor. Dont forget to recalibrate your esteps for your new extruder and check if you have enough tension between filament and the extruder gear. Looking for a bowden style version? Printing PETG works good for me after upgrading!